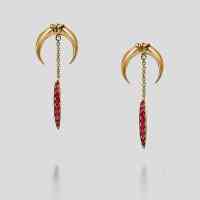 This short version of the Snake Bite earring will soon become your go-to earring to liven up your jewellery routine. Wear the earrings to work and show your rock chick side while still channeling your inner fine jewellery addict. You can personalise the earring to suit your style by selecting from a range of golds including black diamonds and blue sapphires.